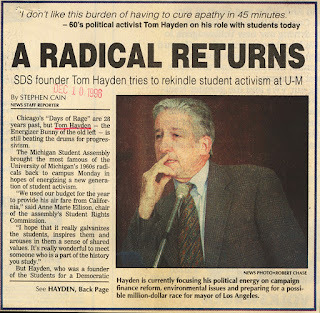 I met Tom Hayden during a press conference in the early 1980s attended by a large, outdoor crowd of students at Cal State Long Beach where I later earned a degree in journalism. I can’t remember if Hayden was already a state assemblyman, or running for the office at that time. He served in the Assembly from 1982 to 1992 and as a California state senator from 1992 to 2000. Hayden was one of the Chicago Eight, later called the Chicago Seven after defendant Bobby Seale was tried separately. The anti-Vietnam War activists were indicted on federal charges of conspiracy and incitement due to their involvement in the violent protests at the notorious Chicago Democratic National Convention in 1968. Their conviction was later overturned. 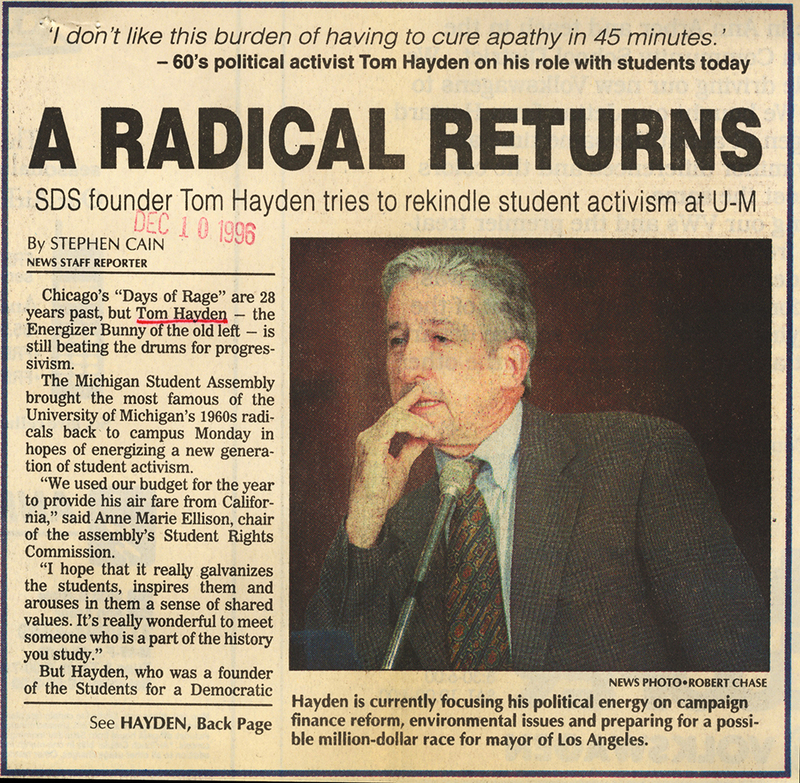 Hayden was also one of the founders of Students for a Democratic Society (SDS), a left-wing oriented group that was active in the 1960s. He was married to actress Jane Fonda from 1973 to 1990. Fresh from my transition from musician to college student, I asked Hayden if he thought marijuana should be legalized. He was reluctant to answer the question and joked, “You’ve got to give me a minute. I’m too high to answer that question right now,” prompting laughter from the assembled students. At the end of his extensive joking, he said quietly, “It should be the same as alcohol.” I don't think he wanted to be known as a pro-legalization advocate during that time of his career. Abbie Hoffman was also one of the Chicago Eight. I interviewed and photographed Hoffman in 1987 at UC Irvine when I was a reporter at the Irvine World News. Though Hoffman was a respected anti-war activist, author and university lecturer, his speech at the open-air campus rally was comedic as well as political. He railed against then President Ronald Reagan and the Iran-Contra scandal, and urged students to protest university research in Reagan’s Strategic Defense Initiative, commonly known as the “Star Wars” missile defense initiative. Diagnosed as bipolar, Hoffman committed suicide two years later in 1989. The New York Times reported that a coroner found the residue of 150 phenobarbital pills in his system, along with evidence of alcohol ingestion. 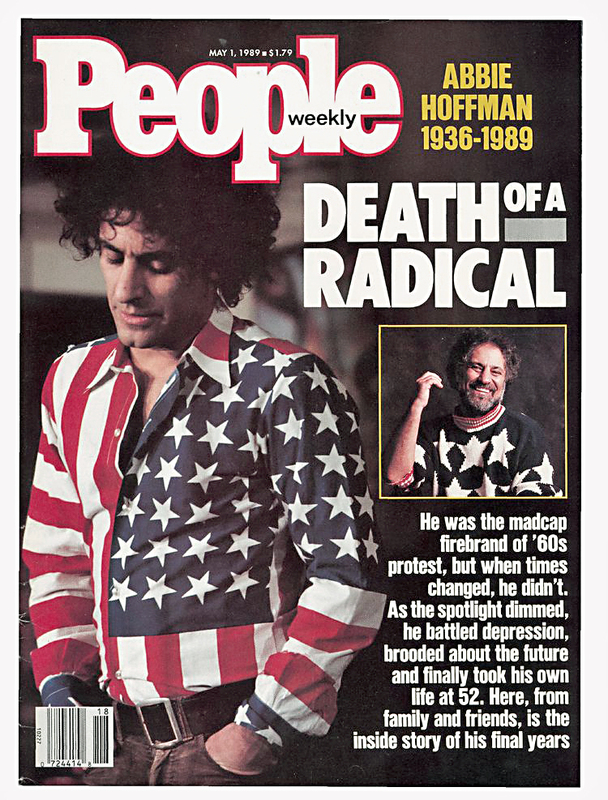 Though Hoffman did his best to encourage the college crowd that day to help create a new generation of student activism, I remember his speech best as a superb standup routine. He could have killed at any comedy club in the country. Thirty years later, I can’t remember the event well enough to quote his humorous remarks, but no doubt about it, inside this scruffy rabble-rouser was the heart of a funny, funny man.